I’ve been watching my SATC DVDs again and am surprised by how differently I feel about the show now: I still love it, Samantha continues to be my favorite girl, but Carrie is the biggest pain in the neck ever – my goodness, the woman is annoying! Oil a 20cm (8in) square cake pan and dust well with icing sugar. Combine ½ cup water and cinnamon quills in a small saucepan over medium heat. Bring to a boil, reduce the heat and simmer for 5 minutes. Remove from the heat, set aside to cool then remove the cinnamon quills. Place the gelatin and warm water (extra) in the bowl of an electric mixer, stir well to combine and set aside. Place the sugar, glucose and 1/3 cup (80ml) of the cinnamon infusion in a saucepan over medium heat. Bring to the boil and cook without stirring for 5-6 minutes or until soft ball stage (115°C/240°F) on a sugar thermometer. With the mixer running at high speed, gradually add the hot syrup to the gelatin mixture. Beat for 10 minutes or until thick and fluffy. Pour into prepared pan, cover loosely with lightly greased non-stick baking paper and set aside to firm overnight. Place the icing sugar, corn starch and ground cinnamon in a bowl and stir to combine. Turn the marshmallow onto a surface lightly dusted with a little of the icing sugar mixture and carefully from the pan. Cut into squares with a lightly oiled knife and dust with remaining icing sugar mixture. Yeah Samantha is my fav too. Never made marshmellows at home. Looks so so fluffy yumm. I have really got to try marshmallows sometime. You make them look so pretty! I see you actually are quite a marshmallow maker!! You make marshmallow of all sorts of flavors!! Amazing! The only marshmallow I like to eat are homemade. Yours look fabulous. I have never had a cinnamon marshmallow, but I feel I need to have one now! Those are so pretty! Charlotte has always been my fave. Plus Kristen is just so gorgeous! 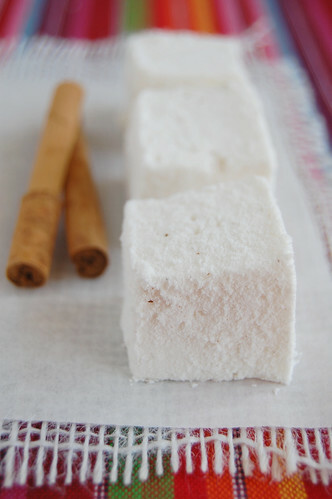 I have "make marshmallows" on my list of goals for 2010! Yummy! I do love homemade marshmallows. Love the idea of the cinnamon flavor. These look wonderful, Patricia. I really must make these soon. Never have attempted it. 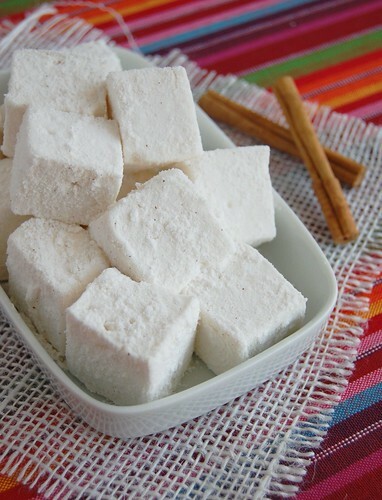 Someone online had a site where they sold homemade marshmallows- tons of flavors. Our favorite was chocolate chip. Pretty good product actually, but it would be more fun to make them yourself. Kelly, I think you would like these! Thank you! I hope you check that item off your to do list soon, dearie! Barbara, that is a great idea - I think I might try making choc chip marshmallows next time. Thank you for the wonderful inspiration! Hi, beautiful! I think they would be really good paired with chocolate, indeed - what a great idea! Pillowy soft, angelic and yet devilishly good! In some hot chocolate, oh these would be so good. what a woderfull food !really i like it. I think you could, but I haven't tried it yet - let me know if you do? I'm more a Charlotte kind of girl but I love Samantha's temper ! Your pictures are very nice, thanks for this recipe ! I felt the same way, re-watching the series years later! I liked Carrie originally -- quirky, funny, a writer -- but on re-watching she was so whiny and childish. Ah well. Beautiful marshmallows, would love to try so many things here. Do you have any tips for food photography? Your work is gorgeous. Hi, there! Thank you for your kind words! I have one rule: I always, no matter what, photograph using natural light - never at night and I never use flash. I'm going to try these this weekend. Thanks for the recipe!